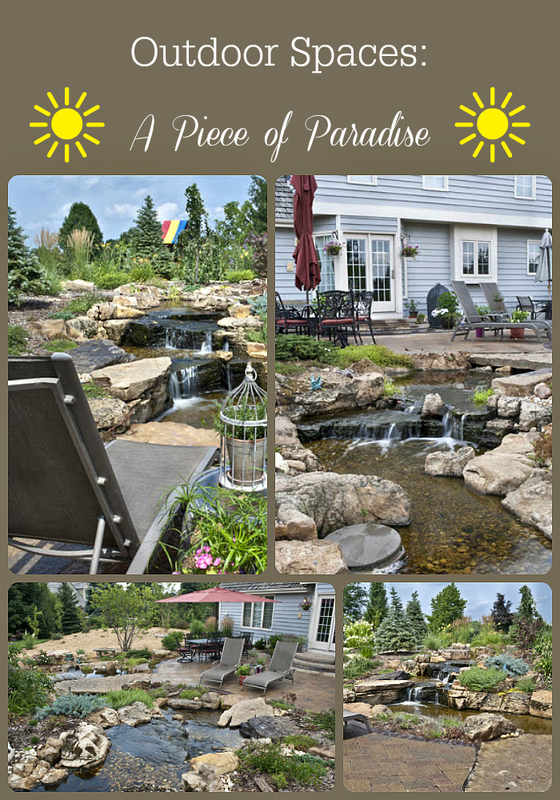 Outdoor Spaces: A "Peace" of Paradise - Aquascape, Inc.
With the financial stress of today’s economy, we could all use a little “peace” of paradise to calm our nerves and lift our spirits. Investing in a small (or large) water feature is truly an investment in your health. Listening to the melodic waterfall while sitting by the pond’s edge is sure to lower your blood pressure and improve your outlook on life. Placing your water garden near your house allows you to hear your waterfall through open doors and windows. When time allows, pull up a chair and sit a spell outside. The view from the house and patio. Evergreens and ornamental shrubs soften the edges of the rock. … and streams its way toward a fire pit with seating. Perfect for magical evenings making s’mores and enjoying the sound of bullfrogs singing. To the left of the larger waterfall is a stepping stone staircase for easy exploration. Entertain guests for dinner on the patio, or cozy up next to someone special in the lounge chairs. So much to enjoy in this “peace” of paradise!